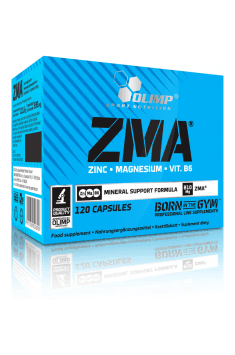 ZMA® Food supplement with zinc chelate, magnesium and vitamin B6 in capsules. This supplement contains magnesium which contributes to muscle function, normal energy metabolism, normal protein synthesis and to reduction of tiredness and fatigue. Zinc contributes to the maintenance of normal serum testosterone concentrations and to the protection of cell constituents from oxidative damage. Moreover vitamin B6 contributes to normal red blood cell formation and regulation of hormonal activity. Due to these properties ZMA is perfect product for athletes and active persons. Men: 3 capsules a day, women: 2 capsules a day, 30-60 minutes before sleep or differently after consulting a doctor. The preparation helps to stabilize testosterone level in the organism and may supplement insufficient supply of zinc, magnesium and vitamin B6. Used before sleep it improves its quality and effectiveness. 87.4% ZMA® (L-OptiZink®), anti-caking agent - magnesium salts of fatty acids, capsule (capsule component) - gelatin, color: E 171).